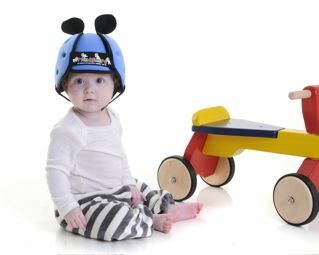 If your baby walks across the room unsteadily and looks like he is about to stumble and fall, your instinct will be to catch him regardless if he is wearing head protection or not. After all, you wouldn't be lulled into a false sense of security and let your pre-school child cycle on the road just because he is wearing a cycle helmet! Just like you would teach your child how to safely cycle, ice skate or swim, you will set safe boundaries for your baby to learn how to walk. You may have a lot more peace of mind when your child is wearing a Thudguard but the fact that you are safety conscience enough to get a Thudguard in the first place, suggests that your not a parent to take risks. We have all heard the argument that forcing drivers to wear seatbelts will lead to reckless driving due to the increased feeling of safety. This old argument is completely ridiculous and not grounded in fact. Whilst there is no strong evidence that the wearing of seatbelts have significantly reduced the number of deaths from road traffic accidents, there is no doubt that they have significantly reduced the severity of the injuries sustained by individuals involved in such accidents. When a new safety product comes on the market it is common for attention to focus on whether or not this product will actually save lives. This is to miss the point. Thudguard does not claim to significantly have an effect on very serious head injuries but, as stated, may significantly reduce the number of minor head injuries which occur. This may not only reduce discomfort associated with such injuries amongst the patients but also have an impact on the workload of the emergency services with regards these injuries. We plan to use this product with all future grandchild (our children agree) and share this golden information with as many people as we can!